Why does some tea cost more than fine wine and occasionally exceed the price for its weight in gold? While researching her latest novel, The Tea Girl of Hummingbird Lane, author Lisa See sampled many cups of tea, including some of the world’s rarest and most expensive. To set the scene for characters whose destinies are entwined with China’s wild Pu’er trees, See met tea farmers, tea masters and high end purveyors, who shared their vintage varieties, including a cup made with tea that cost $1,000 an ounce. Pu’er is a microbially fermented tea from the southwestern province of Yunnan, obtained through the action of molds, bacteria and yeasts that live on the trees. The finest Pu’er tea, which at a recent auction sold for $300,000 a kilo, is not even China’s most expensive tea. That honor belongs to Da Hong Pao (Big Red Robe), a dark oolong tea, which recently sold for $1.5 million per kilo. Rarity is key. “Like diamonds or fine wine, Pu’er is expensive because of its rarity,” said See. The most expensive tea leaves are not harvested from cultivated, manicured and cloned shrubs found on plantations, but instead grow on wild trees, often in remote mountain locations. Such wild trees have a distinctive genetic makeup, grow without human intervention, and derive some of their flavor from neighboring vegetation. Wild tea trees can live for more than 1,000 years; the longer the lineage, the more valuable the leaves. The aging process contributes to the pedigree and the price tag. Naturally aged teas, processed without artificially altering the normal timeline of oxidation or fermentation, will command a higher price, in part because it lengthens the wait before a tea grower can earn a return on investment. Some rare teas are said to confer health benefits, attributed to the tree’s ability to survive for centuries. When See began writing The Tea Girl of Hummingbird Lane there were 200 studies underway about Pu’er’s health benefits, including the tea’s ability to lower cholesterol and blood pressure. When she turned in her manuscript, there were over a thousand studies. Not all expensive teas are fermented. 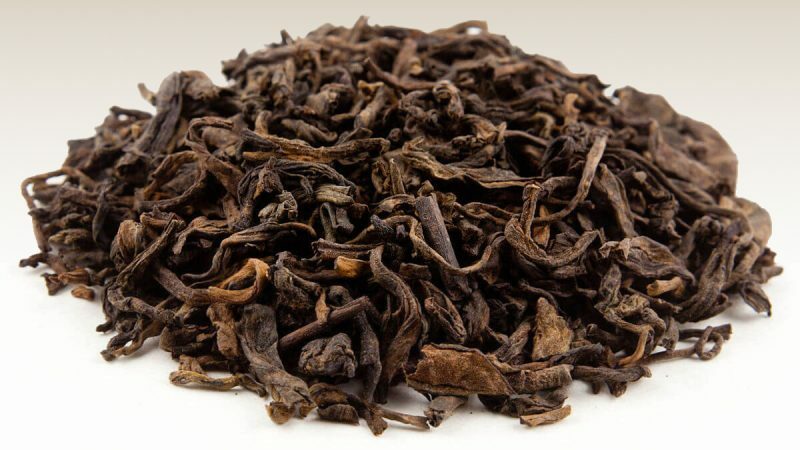 Da Hong Pao is a heavily oxidized dark oolong tea, grown in the Wuyi Mountains of Fujian Province in China’s southeast. Cuttings taken from the original plants have been used to produce similar tea from genetically identical plants, but tea that is harvested from the original bushes, now estimated to be nearly 1,000 years old, come with a much higher price tag. Processing plays a part in Vintage Narcissus, an oxidized Chinese oolong tea that tastes of flowers and chocolate, priced at $6,500 per kilogram. Also cultivated in the Wuyi Mountains, the tea is fired once every two years, to help any extra moisture dry out. Another factor affecting tea price is the number of times the leaves can brew a flavorful cup. The same Pu’er tea might be used fifteen times before the flavor is diluted. Tieguanyin, named after Guan Yin, the Mahayana Buddhist goddess of mercy, sells for about $3,000 per kilo, but the blend of green and black tea can be brewed up to seven times and still retain its flavor and fragrance. Korea’s rarest teas also derive their distinctive flavor from growing on “wild isolated bushes, often in steep places, sometimes amid thick strands of bamboo,” said Brother Anthony of Taizé, the co-author of The Korean Way of Tea. Their remote location rules out machine processing but also means the tea is free of chemicals. There are conflicting stories about how tea arrived in Korea. One says an Indian princess brought shrubs when she married Korean royalty, while another credits Korean envoys to the Chinese court. However tea came to Korea, by the time Queen Seon Duk (606-647) ruled the ancient kingdom of Silla tea was served at court and associated with Buddhist ceremonies. With the rise of Confucianism during the Chosun Dynasty (1392-1897), tea culture was suppressed, but there has been a recent resurgence of interest in tea culture and the rarest, most expensive varieties. According to Sharyn Johnston, Australian Director of the World Tea Organization, the most expensive Korean tea is Bohyung Gold Tea. Even an ardent, well-funded tea aficionado might find it difficult to sample some Korean teas, because they are not for sale. Many of the finest artisan teas continue to grow near and contribute to the economy of some Buddhist temples. Park, who grew up in the U.S., became fascinated with tea and teaware while exploring his Korean heritage. The potter and retired university professor now seeks to share his knowledge of Korean tea culture by leading tea tours and sharing select teas, mostly artisan and temple teas. There are subtle differences between the traditional tea ceremonies found in China and Korea. Compare this simple Chinese tea ceremony by artist Si Chen and to this traditional Korean tea ceremony on Park’s blog Morning Earth Korea. Savoring tea – in Seoul or Shanghai, with great ceremony or simply with friends – allows you to appreciate the moment. Lisa See, The Tea Girl of Hummingbird Lane (Scribner, March 2017); Brother Anthony of Taizé and Hong Kyeong-hee, The Korean Way of Tea: An Introductory Guide (Seoul Selection USA, 2011). The story was originally published on the Los Angeles Review of Books China Channel.